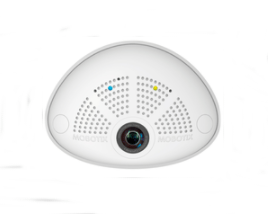 The Mobotix i26 Indoor camera has a hemispheric view allowing for a wide coverage of an area. This could be especially useful in applications such as in a reception area / lobby. The i26 features hemispheric distortion correction which allows for the image to be fixed before it gets to the workstation. This also allows for the image data to be reduced before it gets transferred and saved. Due to this decentralized solution from Mobotix, it lowers the amount of network traffic from the cameras and even allows several cameras to be displayed on a computer or mobile device. As this camera is part of the new Mobotix 6 Series, it boasts Mobotix’s new dual microprocessor which is capable of producing up to double the image rate at the same resolution of their 5 Series counterparts. As well as a new processor, the cameras have also received a boost in storage capacity to allow for additional software. The i26 allows for a hemispheric view, and its possible if placed above the door you may be able partially underneath or into the doorway itself.